Project Sunshine Canada's Shine On! 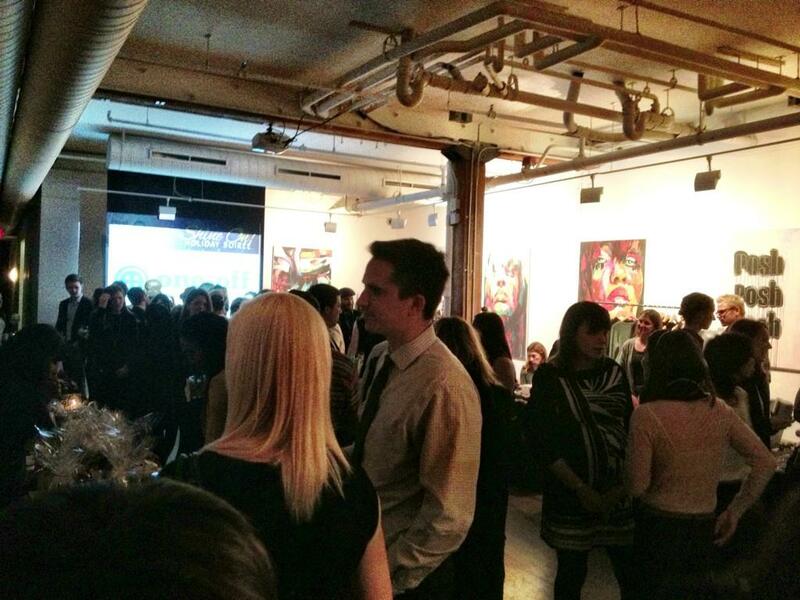 Holiday Soirée, which we've been excited about all week, has come and gone and was everything we hoped it would be. To say that the talent in this city is inspiring is an enormous understatement for me. Some of the coolest, freshest, and most interesting pieces were displayed last night by designers in the city that evoke the same. 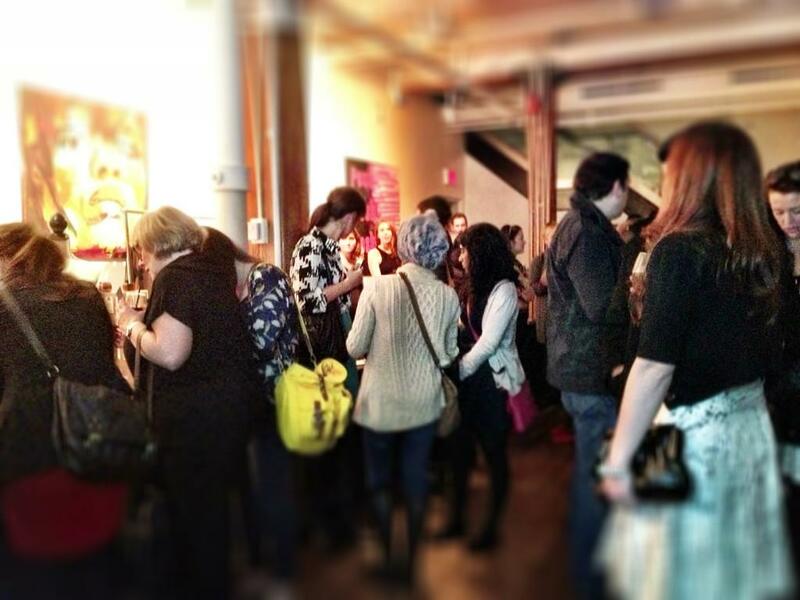 Everything from hand-printed ceramic wares, to hand-crafted metal jewelry, to consciously composed leaf tea of international quality, both ethical and refined, were displayed and celebrated amidst a flurry of Toronto's young, creative, and professional. Project Sunshine Canada is non-profit, local organization that provides free, interactive seminars and programs for children who face medical challenges (and their families) all over the GTA. 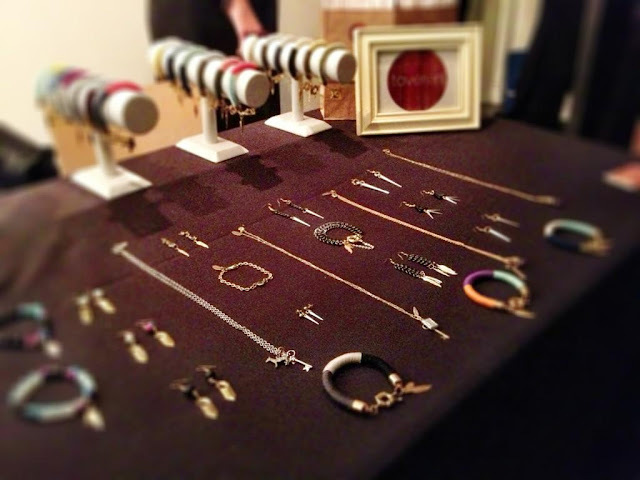 Shine On!, developed by the Project Sunshine YPC, was meant to create an opportunity for consumers to not only support local Fashion, but support a fantastic, local cause at the same time. Visitors were treated to complimentary (and delicious!) hors d'oeuvres, drinks, a silent auction featuring some of the fantastic talent in the room, as well as the chance to mingle with designers and shop their wares; all the while contributing to Project Sunshine Canada and their ongoing work in the community. 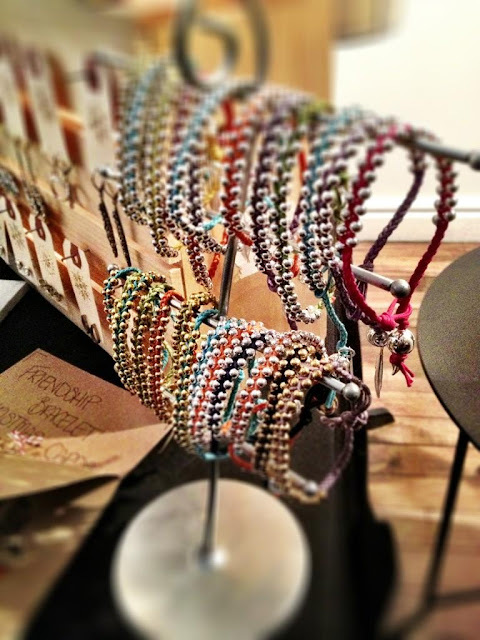 Held in the earthy and urban Spoke Club on King West, Shine On! had a fantastic energy and an even better turn-out! I had the chance to chat with some of these great designers who have literally uplifted their products and businesses from the ground-up with sheer talent and devotion to their craft. 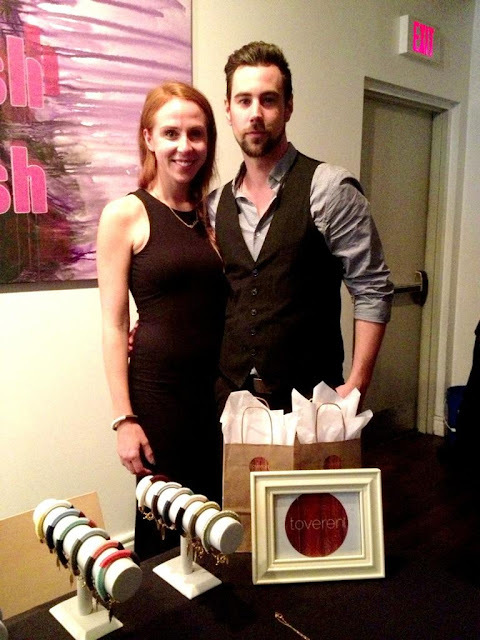 One of my favourite creators at the event was undoubtedly Alessandra Cardarelli, brainchild behind Carte Blanche Creations, who produces the most clever and beautiful ceramic coasters (among other things!). Unable to share the "secret" of her trade, Cardarelli herself can print anything from photos on Instagram, to vintage family photos, to custom typography on slabs of square ceramic. An eclectic, colourful, and even personal touch to anyone's home - I'd love to have these in my apartment! I noted that they might even make a fantastic back splash for someone with a kitchen the size to hold it. Wonderful work! 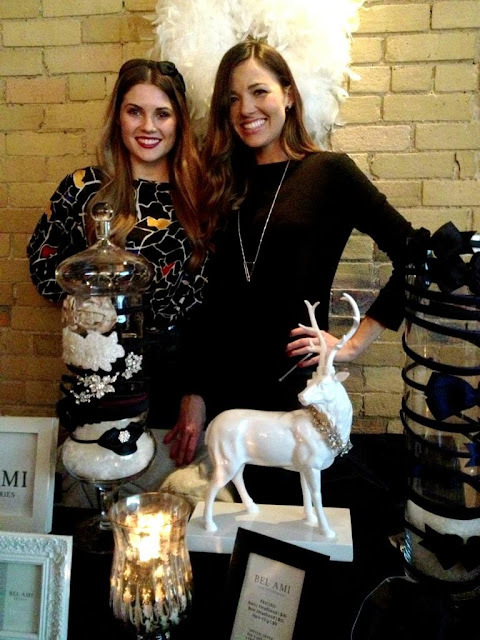 I also had the pleasure to meet the woman behind perhaps my favourite jewelry showcase at Shine On!, White Feather Designs. Breanne Morrow was an absolute delight - perky and full of energy, she displayed some of the coolest metal work I've seen in the city. 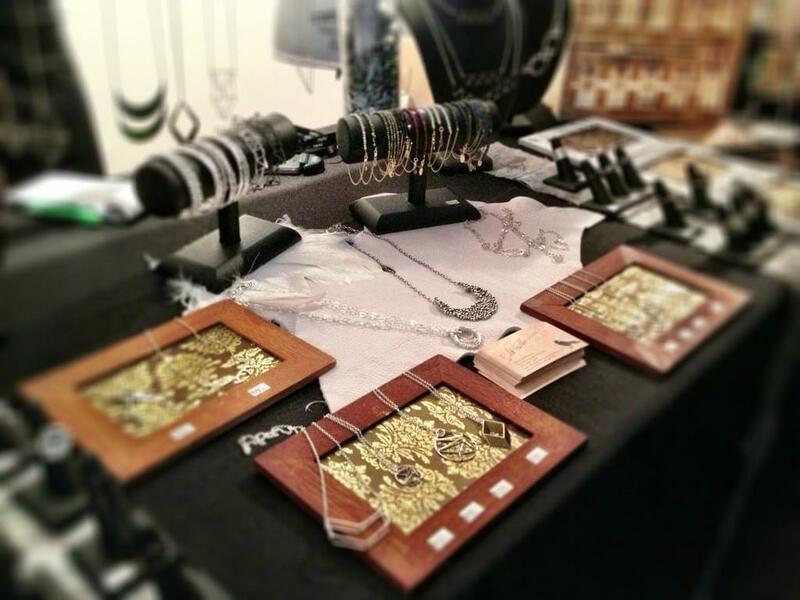 Hollow, geometric pendants and pieces in hard, triangular and equilateral shapes caught my eye from a distance! These pieces are not only totally on point in terms of trend, but hand-crafted by Morrow herself in meticulous detail. The same can be said for her collection of earrings, bracelets, and absolutely adorable packaging! It's all in the details; I loved it, and her! 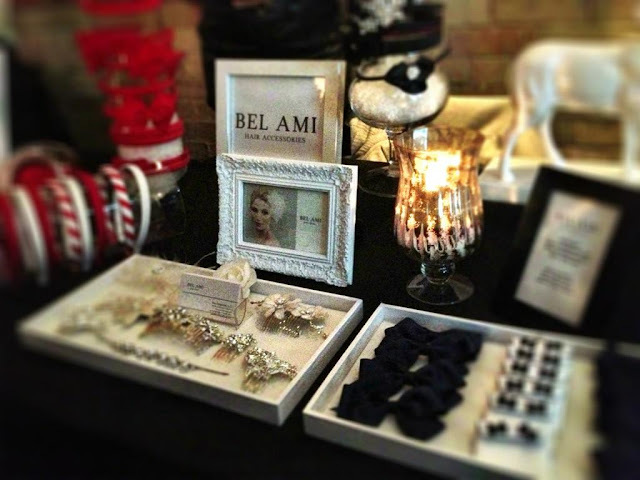 The girls of Bel Ami Hair Accessories were also a unique and wonderful addition to the showcase. Exuding utmost passion, owner Eriz Fitzpatrick was quick to express not only her passion for Project Sunshine and the work that it does (she's on the YPC! ), but also in her involvement in children's lives beyond just that. Providing custom-created head bands and hair accessories for schools across Ontario, Canada, and even internationally, Bel Ami has established a reputation of refined creation, hospitality, and utmost quality. We loved her head bands and especially some of her more chic, demure pieces that would be a welcome addition to anyone's wardrobe, in school or not! While at Shine On! I also had the chance to meet and speak with the powerhouse design-duo behind Toronto's acclaimed LABEL. One of my favourite teams in the city, Shawna Robinson and Natalie Sydoruk have consistently produced pieces for Fashion Week that are wearable, interchangeable, and uniquely characteristic in terms of design. As a result, LABEL has quickly developed and maintained an aesthetic of itself, and is touted, by myself included, as one of Toronto's best local design houses. The girls were magnificent! We had a small conversation about how I think it's interesting that I've recently been noticing companies taking a greater interest in melding the world Fashion with humanitarian causes, community relief, and world events. Which have provided opportunities for people within the industry, and enthusiasts alike, the chance to expose their talents and businesses in a way that creates real change beyond just Fashion alone. I asked them if they think the Fashion world should push this approach more strongly, and if the market should take a more active role in this direction. The girls were quick to say that, to them at least, they run their Fashion line like the lead their lives - "We do our best." They were adamant in the fact that, regardless of industry, business, or personal life, people should take an interest in their community and find ways to make those connections happen. As an ethically-conscious design team, I wasn't surprised in the least; and was inspired by not only their always fantastic work, but by their tenacity and values. A pleasure, to say the least! At the end of the day, Shine On! couldn't have been more successful in my eyes. I can only wish the YPC as well as Project Sunshine Canada the utmost success in their continued professional ventures and wonderful, ongoing work for children all across Toronto. It was a wonderful experience to participate in something that valued Fashion but, at the same time, consciously kept a hand in our community. It goes beyond just Toronto as an artistic hub, but Toronto as a real, connected city. A treat and an inspiring night! Thank you Project Sunshine Canada - to your future. Here are some more pictures of our night! 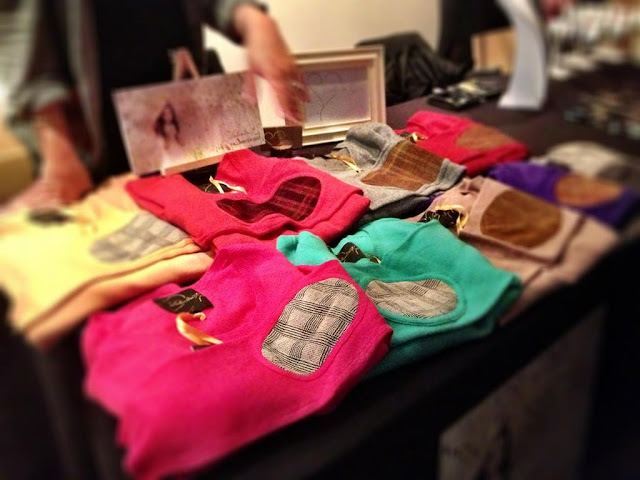 Lauren McLachlan, a pleasure to meet, and her beautiful collection of Cashmere creations - Valentine K. Warm and divine to touch! A must-have this Winter. Toveren, and their fantastic metal work! The team behind Toveren, featuring the talented and beautiful Carleton Eckhardt. Holi-daze In The City / Winter Update!